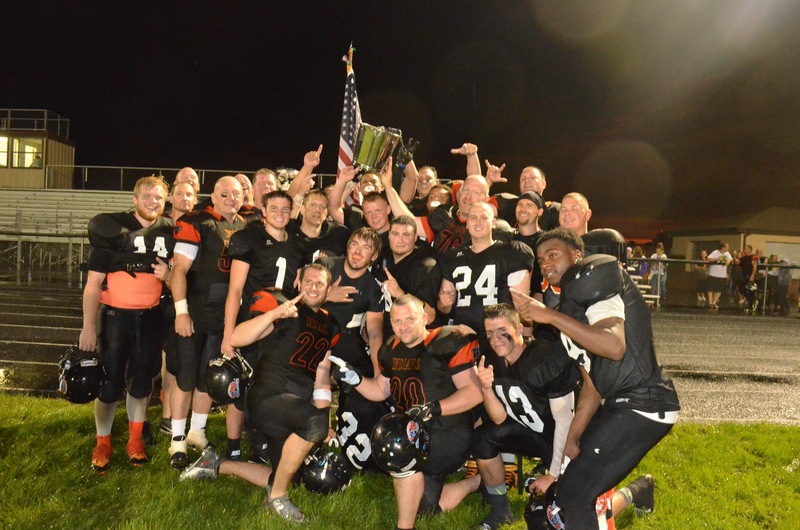 PECATONICA – The Glory Days football game between alumni football players from Pecatonica and Winnebago High Schools, in Pecatonica on Saturday, June 20, renewed the gridiron rivalry there once was between these two schools. I remember looking at the Pec-Bago rivalry like a Bears-Packers rivalry. At stake was the coveted Silver Bucket, a trophy that began traveling back and forth between these two rivals in 1961. After the 1989 season the two rivals actually joined forces for a few years. Eventually the two schools went back to having their own teams. The rivalry showed right from the start in the first quarter as some fisticuffs took place and a player or two was ejected for the first half. Winnebago jumped out on top 14 – 0 after the first quarter. Pecatonica got the ball back deep in their own territory with under a minute to play in the first quarter. 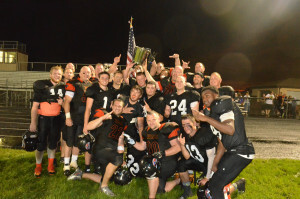 They grinded it out with their rushing game, working their way down to Bago’s goal line, while eating up almost all of the time in the quarter. The Pec Indians had the ball first-and-goal at the one-yard line with under two minutes to play before halftime. Winnebago’s Indians were able to hold though, and the ball was turned over on downs with 1:29 to go. When the Bago Indians got the ball they got a big pickup on a long pass up to about mid-field, but time ran out at the half. Mother Nature almost stopped game, as it rained almost the entire time with occasional lightning flashes that caused about a half hour delay. Before the rain delay the stands were almost full. Most fans went home after the delay. The game picked up again with six minutes left in the third quarter with the clock running. Pecatonica got the ball back with time winding down in the game and they were moving the ball well downfield. But, Winnebago then intercepted the ball, icing the game for Winnebago with a 14 – 0 victory. The players then lined up for the handshake and posed for a group picture with all the players. mecoming Kings and Queens.as sure fun seeing the old rivalry renewed.